Color by number worksheets are great learning tools—they can help with number as well as color recognition. Children has to recognize the number given in each part of the picture and color it with the corresponding color for that number. Help your child learn to recognize basic colors with these printable color recognition worksheets. Child has to color the given objects using the hint/matching color. 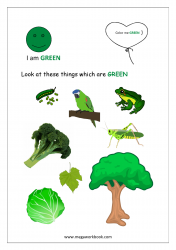 These worksheets are perfect as part of any preschool curriculum and will help kids recognize all their basic colors- red, blue, green, yellow, orange, pink, brown, black and white. 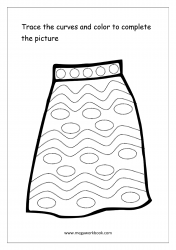 Help your child learn to recognize basic colors with these printable color worksheets. 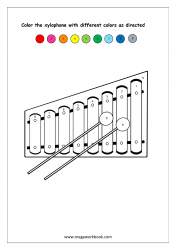 Each worksheet focuses on one color showing the objects of that color in real world. 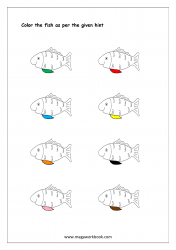 These worksheets are perfect as part of any preschool curriculum and will help kids recognize all their basic colors- red, blue, green, yellow, orange, pink, brown, black and white. Pattern Identification - What Comes Next? 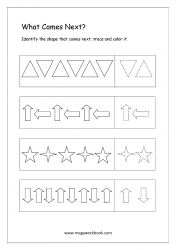 These activity sheets test and enhance your child's aptitude and ability to identify what comes next based on a pattern. Learning to count with shapes is a fun way to understand shapes as well as learn counting. Check these worksheets to get your child in action. 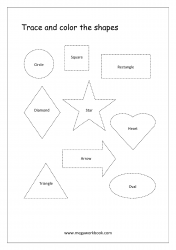 These shapes identification worksheets are designed to help children in shapes recognition. 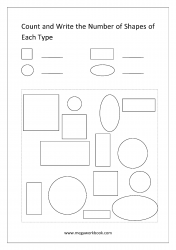 The worksheets have a lot of different shapes to build the objects/scene so that your child can use his/her mind to identify those shapes. 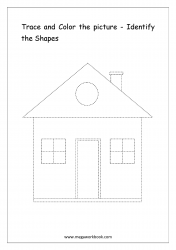 Here are some free printable worksheets for Shapes Tracing and Coloring. Start with basic shapes (circle, square, triangle, rectangle) for the beginners and see when your child can move on to the more advanced shapes. Learning to trace/draw lines (standing, sleeping and slanting) and curves is the first step towards writing. Check these free printable pre-writing worksheets to give your child enough exposure to line and curve tracing before you introduce them to writing letters and numbers.